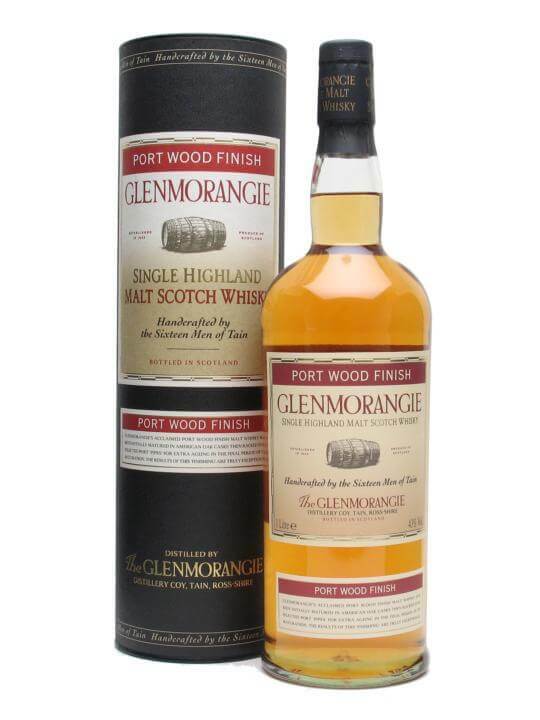 We had a sherry cask-finish Glenmorangie yesterday, and today we'll have the port finish. In scotch whisky maturation today, casks that once held sherry or bourbon are most commonly used, but before the 1930s distillers would use (almost) any cask they could get their hands on (port, wine, madeira, sardines, olives... etc.). They were also known to line their casks with molasses and other such things to add colour and flavour. This doesn't happen anymore. Port is sweet fortified wine from the Douro river valley in Portugal. Although other countries produce a similar copycat product, in Europe and in Canada 'Port' can only refer to the fortified wine product from Portugal. Port is basically wine fortified with a bit of brandy or distilled grape spirit added and then matured in casks. When these emptied casks are used for scotch whisky maturation, they usually impart a pinkish or ruby colour to the whisky. Many people have the misconception that 'finishes' are a cheap marketing gimmick in the world of malt whisky. This is not necessarily the case. As I have posted before and as I said yesterday, the idea of finishes or secondary maturations was re-introduced in modern times by Glenmorangie (and Balvenie... 12yo is "Double Wood"), a single malt whisky that is almost all matured in first fill ex-bourbon casks. To impart different flavour profiles, the distillers decided to attempt secondary maturations after 10-ish years to see what different characteristics could be added to an already enjoyable and popular whisky. It must be understood that not all casks mature the same way and not all casks (about 5-10% on average) of maturing stocks at any given distillery are intended for release as a component of their single malt. The rest goes to blending. At Glenmorangie, the percentage released as singles is MUCH higher than it was before the finishes range was introduced (around 70%). As we know, standard blends are typically cheaper, easier to drink or mix, and exhibit less pronounced character; they are designed to appeal to the masses and sell in volume. If distillers could use some of these maturing stocks and make them tasty enough to be bottled as single malts then why shouldn't they do it? More different expressions for us to try and more money for them. Sounds reasonable to me. Additionally, spanish oak casks that once held sherry are about 10 times more expensive that bourbon casks and still significantly more expensive than wine or wine spirit casks. Sherry casks add flavour, texture, and, most importantly in the world of finishing, colour. But if a more affordable oak was available that did a similar thing, wouldn't it be wise to explore that option? So everyone is, from Arran to Tullibardine and blends including Famous Grouse and Grant's. The problem arises when distilleries, especially ones that come into new hands, end up releasing half a dozen finishes a year that are obviously masking whisky that has not matured well. I can think of one distillery in particular that has really hurt its reputation in recent years by doing just this. The neat wooden boxes seem to help sell the stuff, though! For a new or young distillery to do this makes financial sense because the first decade+ can be very tough for new distilleries. Isle of Arran just had their first year in the black since 1995, Bruichladdich rides a fine line between red and black every year, the owners of Tullibardine have developed a beer and a shopping complex to help the distillery remain financially viable, and Edradour is greatly helped by a much-visited tourist facility and shop. Glenmorangie is neither new nor in financial trouble. But they have always kept their casks close to home, trading VERY little with other distillers (generally a normal practice... for blending purposes). They put their own malt in their delicious blend, Bailie Nichol Jarvie. So we can safely assume that their journey down the road of wood finishes is motivated by the pursuit of excellent new flavours and sustained by increased revenue. As long as the stuff tastes great, can we really blame them? HERE is a piece from The Scotch Blog on the impact of wood in finishes. This bottling we're tasting today has been discontinued. Its new incarnation is two years older and called "Quinta Ruban". For more distillery info and other Glenmorangies had on the mission, click HERE. I don't often mention colour, but this one does indeed have a pinkish hue, light rosé wine. Quite fruity, with a dairy element, too. Like a cheese plate with grapes and such. There is a coastal element in here, too. Salt, capers, and creamy Greek yogurt. Toffee and vanilla with a firm mouthfeel. Lime gelato, buttery fudge, and a little bitterness like apple peels that controls the sweetness and adds a pleasant oakiness as well. Rosemary-type flavour is faint through a medium long finish that is like a cheese board... I mean, the actual board after cheese and cheese wax and grapes and crackers have been all over it. The perfumed, bourbon-y spiciness that is so typical of Glenmorangie is really masked by the port influence. A good thing if we want to try something quite different from this distillery, a bad thing if we LIKE Glenmorangie and want to experience it accented by port (or whatever). Overall, the flavours are pleasant and in good balance, and certainly worth trying. However, I would not recommend this for someone new to whisky. As always, it was interesting to read your take on "finishes": at BenRiach our preference is to call this "wood management". "Finishes" will fulfill the Distiller's objective only if the malt whisky which is chosen is of the highest quality. At BenRiach we have used a number of different cask styles to determine how The BenRiach interacts with various cask styles and during the process we have audited the progress of these casks on a monthly basis, This has given us a comprehensive insight into the "wood management" of these various styles of oak cask. Our objective at BenRiach is to take top quality whisky (12 - 15 years)and craft bespoke expressions with an extended flavour profile landscape: our motivation is driven solely by the pursuit of excellence: and "unlocking the secrets" to our growing fan base. For your information, since the acquisition of the Distillery in April 2004, The BenRiach Distillery Co Ltd has been significantly in profit during every year and indeed, has never once been operating in overdraft - check out our accounts. It is both inaccurate and worse unhelpful to suggest that this company has ever struggled financially.